1995 Bugatti EB 110 GT - Is there such a thing as a "bargain Bugatti"? No, of course there's not. This car, at a half-a-million dollars, is as close as you'll probably get. This is 1 of 95 EB 110 GTs built during Romano Artioli's ownership of Bugatti. It hits 60MPH in 3.2 seconds and has a top speed of over 200MPH. Artioli has been criticized for being too ambitious, a better showman than a businessman. Bugatti is producing some pretty spectacular million-dollar-plus cars these days. Without Artioli's previous involvement and the publicity that brought to the marque, I doubt that VW / Audi would have bought the brand. We'd be missing out on some great cars these days. Give credit where credit is due. This car has just over 900 miles on it. 1979 Renault R15 TL - These cars were barely footnotes in Renault's US lineup in the 1970s. Yes, they were officially imported from 1972 until 1976 or so. Based on the R12 sedan and sharing many body parts / interior pieces with the R17, the mission of the R15 in the US was vague. It looked sporty, but was not quick. It was economical to run, but was relatively expensive to buy. Like many 1970s cars, rust took its toll on the R15. Very few still exist in the US (I haven't seen one since some time in the 1980s). This car is located in France. It has the very desirable European front and back end, along with the equally as desirable later (1977 - 1979) dashboard layout. This car has just 15,000 miles on it. Except for a small rust spot on the fender, it appears to be in very nice condition. Being offered on a website called Leboncoin.fr, click here to see the listing. A big thanks to my friend Jon for turning me on to this website. To see other vintage Euro cars, follow the link provided to see the Renault. Then click on "Voitures" which is found near the top of the listing (above the title) before "Renault 15TL." On the screen that follows click on "Annee-Modele max" and scroll to... let's say "1966." This will serve as a cut off for all later model years. You can change this for other searches as well. Then in the blank space next to "Voitures" type in "BMW," "Peugeot" or whatever. There are a lot of nice early four door Bimmers on that site which go for cheeeeeap money as far as the Euro is concerned. There are quite a few cars that you never even hear of stateside such as the 1930's Simca 5, or the 1950's Simca Plein Ciel. You can find a few imported American rides as well. You can just leave the space to the left of "Voitures" blank to see all makes of autos. I have never ever seen an R15 here in the States and had no idea that Renault did sell them here. I do remember the R17 and clearly remember sitting in a pale metallic blue R17 Gordini at a dealer in 1978 as a 13 year old and lusting after it and trying in vain to convince my dad to buy it rather than a R18 (he got neither and instead bought a 78 Fiat SuperBrava). What a great way to add pizzazz to your line-up without any mechanical engineering whatsoever! Take the 12 Sedan and drop a swoopy body 15 on it. Renault did it before with the Dauphine/Caravelle and later with the 18/Fuego. 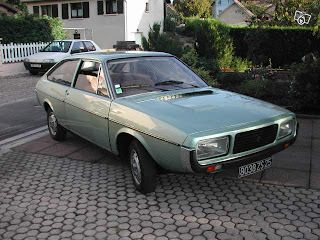 Simca offered the Coupe 1000. Fiat did it with the 850 line, the Sunbeam Arrow had a coupe-bodied sister, and even VW offered the Karmann Ghia for years, and then dropped the Scirocco on the Rabbit drivetrain.